Just came across this mouthwatering seasonal special at Logan's Roadhouse. 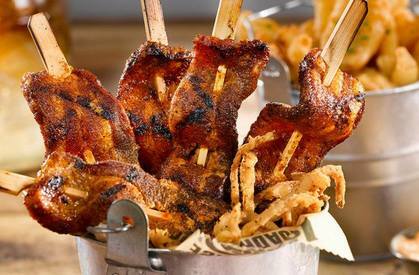 Half pound of 12-hour smoked bacon seasoned in a brown sugar glaze with a kick of spice, grilled and served with crispy onions. Sadly, there isn't a Logan's near me, but maybe you'll have better luck!